Dr. John Hamish Watson was born on the 7th of August 1852. As an injury in Afghanistan ends his career as an army doctor, he tries to make a living practicing in London. From 1881 he shares rooms with Sherlock Holmes and becomes his friend, chronicler and helper in solving crimes. No matter how dangerous an adventure may be, he accompanies Holmes, and his medical knowledge, steadfastness and revolver are at Sherlock’s disposal. Thanks to his writings the public gets to know the unique methods of the detective, while the sleuth thinks these memoirs are too sentimental and romantic. In The Sign of Four Watson meets Mary Morstan and soon after he marries her, but unfortunately she dies at a young age. Sherlock’s brother, who is seven years his senior, appears in three stories: in The Greek Interpreter, The Final Problem and in The Bruce-Partington Plans, but his name is mentioned in several other adventures as well. He is often called the arch-enemy of the detective, but Sherlock had to catch several other significant criminals as well. ( Common misbeliefs: Moriarty is the only enemy of Holmes ) Moriarty is without a doubt the most significant of all the sleuth’s opponents. He starts his career as a renowned professor of mathematics, but after a while he uses his genius to create the perfect criminal network in London. Sherlock is convinced that it is his mission to free England from the evil mastermind. He is even ready to sacrifice his own life for that. The two meet at Reichenbach, Switzerland for a final duel. As we know from Watson, she is „the woman” for Holmes. As we explain in our article on misbeliefs around Sherlock ( You can read here: Sherlock had romantic feelings towards Irene Adler ) it does not mean he is in love with her. Miss Adler is an opera singer – this means she is an independent woman, which was quite unconventional in the Victorian era. In A Scandal in Bohemia the future king describes her as a cold-blooded adventuress who wants to spoil his marriage out of vengeance. As it turns out later, she only wants to secure her life, and it was the king who wronged her. The character of Irene is very important, because in her Doyle shows that women can be as clever as men, and smart women deserve respect. She is the housekeeper of London’s most extravagant tenant, who has to tolerate many things. We only know a few details about her, for example that she is Scottish. Usually she is in the background, but in The Empty House she has an integral part in the events resulting in catching Colonel Moran. She is often angry because of the behaviour of the detective, but as we can see it in The Dying Detective, she is very protective and caring towards him. "....although he is absolutely devoid of reason, he is as tenacious as a bulldog when he once understands what he has to do, and indeed it is just this tenacity which has brought him to the top at Scotland Yard." - told Sherlock. The detective of the Scotland Yard likes to go his own way, but he asks the help of Holmes when he gets stuck. Though he does not fully understand Sherlock’s methods, he respects his knowledge and is ready to admit that his way of solving cases is effective. In the majority of the cases Holmes lets Lestrade getting the credits. In The Six Napoleons there is a touching scene where the inspector praises Sherlock. 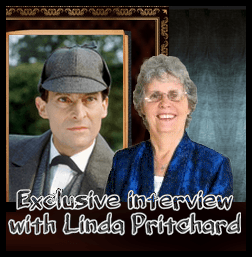 Youtube: Richard Brown video " A Tribute to Inspector Lestrade "
" Characters from the Sherlock Holmes stories "